Another card headed to the MD Anderson Cancer Center in Houston. Our challenge hostess, Victoria has asked us to use strips. I’ve used the MOJO 261 layout. My background is something really new to me…mixed media. I’ve long admired the look and thought this was the perfect challenge to try it. I started out with a piece of scrap mail. First comes a layer of gesso, followed by… you guessed it…strips. Strips of fibers, strips of burlap, strips of tulle…doesn’t matter what color they are because next comes another layer of gesso. For a little more texture I dabbed a piece of bubble wrap here and there. Being rather impatient to see the result, I used my heat gun to dry it. Then I added the color…Adirondack color wash and Glimmer Mist. Next comes a spritz of water, I dabbed it dry and then more layers of color wash and Glimmer Mist. Then it was dried again with my heat gun. Next I took a doily and sprayed it with the color wash and more glimmer mist. It looked too fancy for the look I was going for so I scrunched it and then clipped it between the ruffled edges for a more rustic look. 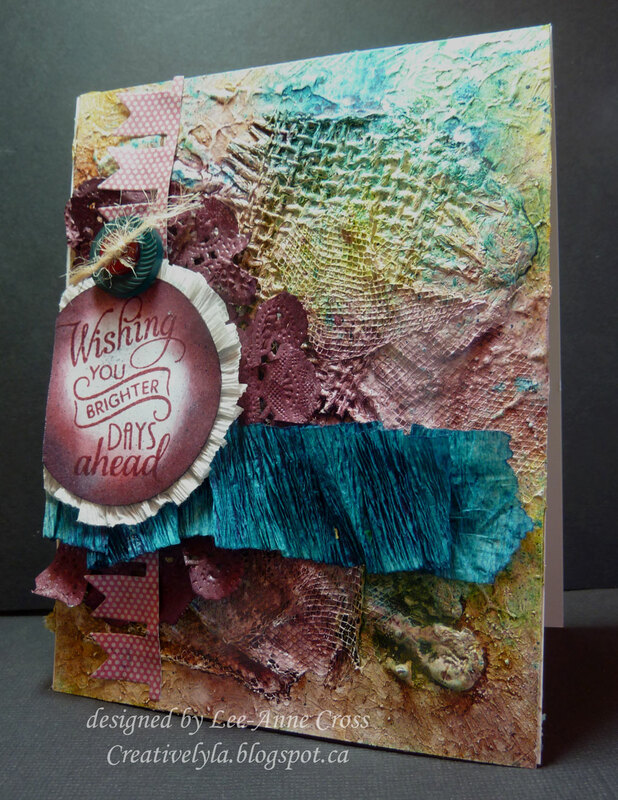 The sentiment was stamped, sponged and then backed with some crepe paper. I torn another strip of crepe paper and sprayed it with more color wash. The banner die cut is a piece of designer paper cut with the fabulous Verve Pennant Trim A Cut Above Die. It too looked way too pristine so I scrunched it! A couple of buttons have been layered and tied with twine for the only embellishment. This was a blast to make and I’ll be making more for sure! Wow, very creative! I like the look of mixed media and I am just too afraid of the mess that I might make. Such a fun card! Love the texture and gorgeous mix of colors.